Darjeeling: The state government has decided to distribute from Saturday ration due to hill residents for the three-and-a-half-month statehood strike. 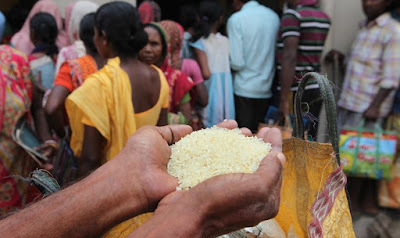 "We are thankful to chief minister Mamata Banerjee, food minister Jyotipriya Mullick and the state government as they have decided to disburse from Saturday ration that could not be distributed during the strike," Binay Tamang, chairman of the board of administrators of the GTA, said after a meeting on Friday. Manoj Verma, principal secretary in the state's food and supplies department, attended the meeting at Lal Kothi in Darjeeling. There are 8.71 lakh ration card-holders in the hills. Sources said that every month, 9,000 tonnes of ration is distributed. "The meeting was very fruitful. We found out that there are only 4,000 people with below poverty line ration cards. There have been some problems and plans are afoot to start a fresh survey and look into these issues as most people in the tea gardens and other places should come under the BPL category," said Tamang. Other matters discussed included increasing modified ration dealers, digitisation of cards, enhancing transport costs for hill dealers, appointing food inspectors, and a separate district controller for the Kalimpong district. "It has come to light that of the 21 posts of food inspectors in Darjeeling, there are only three in the hills now. The meeting was very fruitful," said Tamang. The GTA has also requested that the mid-day meal scheme be implemented through the principal secretary of the GTA as the department is a transferred subject - implying it is under the hill body. At present, the district magistrate is authorised to sanction foodgrain for the meal scheme. "In 1991, the hills were given a special status as designated hill area for PDS. This was discontinued after a few years. The state is exploring whether this provision can be reintroduced. This has to been done by the Centre and, if necessary, we will approach them as well," said Tamang, the GTA chief.